The charming British accent echoed from across the room “Good to see you! How are you guys doing this evening?”. We’d just stepped inside, and already the warm and enthusiastic owner had made us feel welcomed and at home. 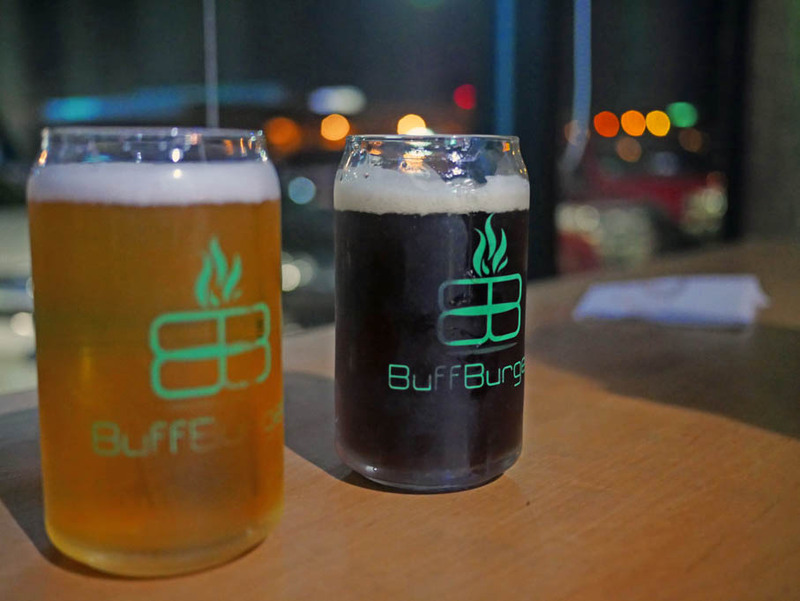 While my husband and I visit and post about our love of BuffBurger quite often, we’d never actually met the chef owner Paul “Buff” Burden before. It didn’t matter – it turns out he treats everyone in the same friendly and engaging manner. 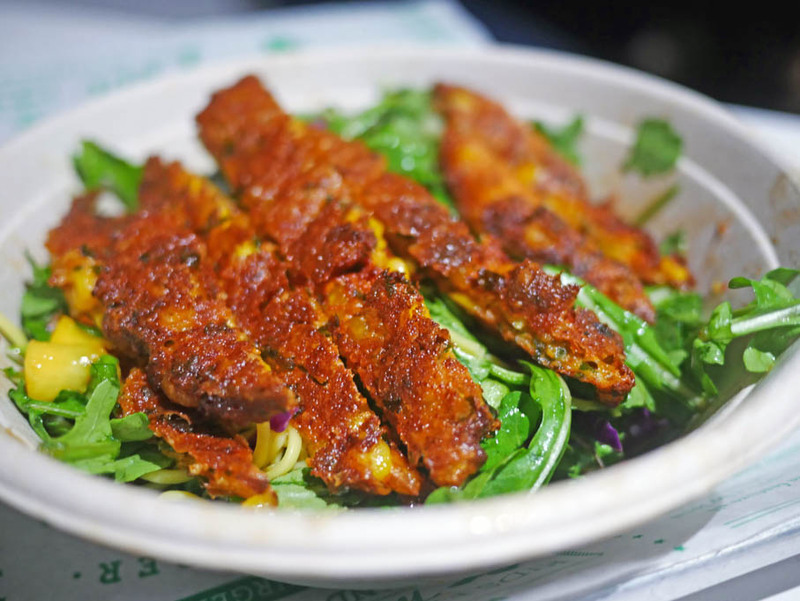 Being a big fan of half the menu already, we knew the trip from Sienna to Spring Branch was going to be well worth it to join the night’s Good Eats foodie dinner. Turns out, the casual farm to table had a couple wonderful surprises up its sleeve for the Good Eats Foodies. 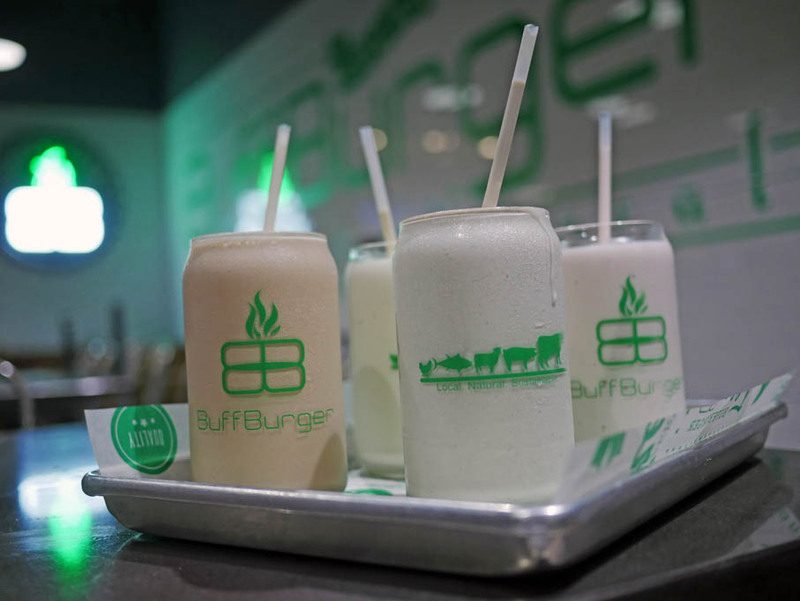 If you’ve never been to BuffBurger, walking in and immediately getting into line to order will hardly give you enough time to figure out what you want. 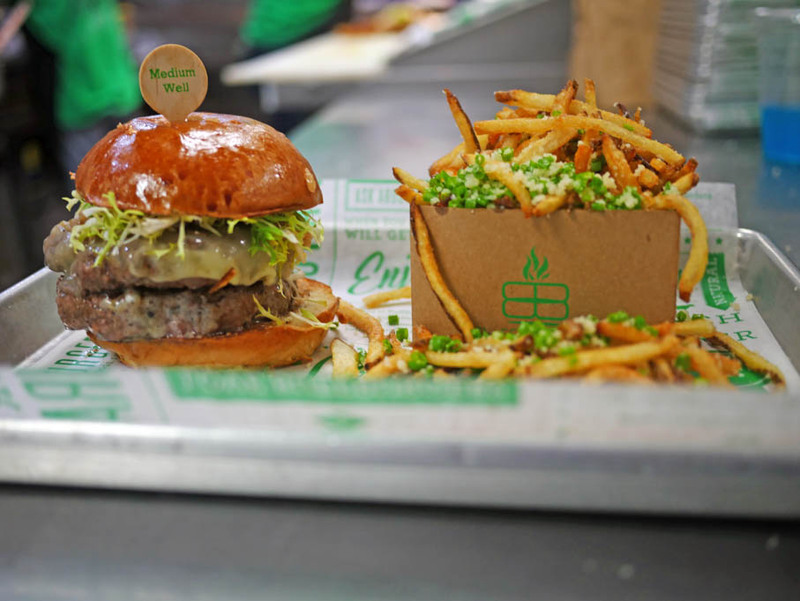 There really are so many appetizing options – from the burgers to the salads to the sides, all the way to what my husband says is a great selection of craft beer and wine(?!) on tap. We’ve been many times, and we still look at the menu online ahead of time. Let’s get this out of the way first – the Texan burger (Crispy Onions, Hand Cut Bacon, Cheddar, Bourbon BBQ Sauce, House Pickle), the Truffle burger (Truffle Cheese, Melted Onions, Truffled Frisee, Truffle Aioli), and the Goat Cheese burger (Goat Cheese, Slow Roasted Tomatoes, Arugula, Truffle Aioli) are all fantastic and personal faves of ours. Our goal for the Foodie dinner was to try new things, and we ended up adding some great dishes to our list. 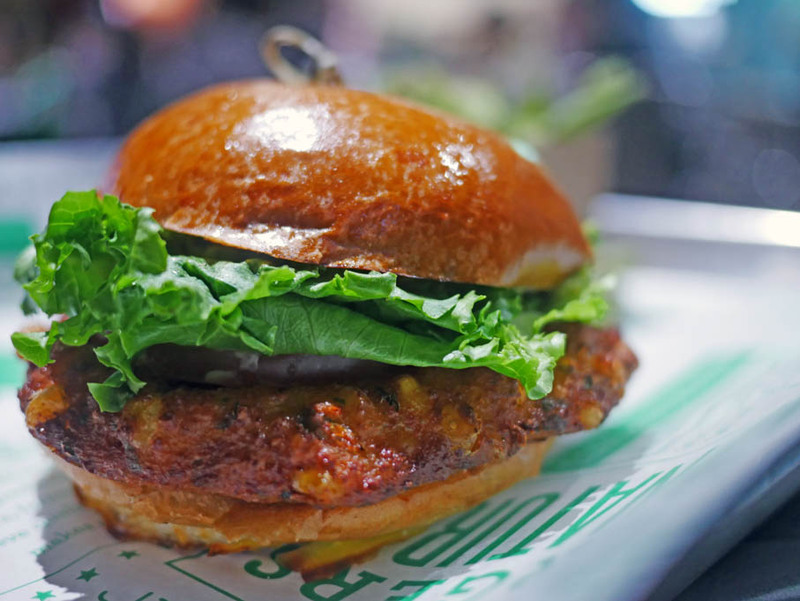 We started off with a burger straight from heaven: the Blue burger. 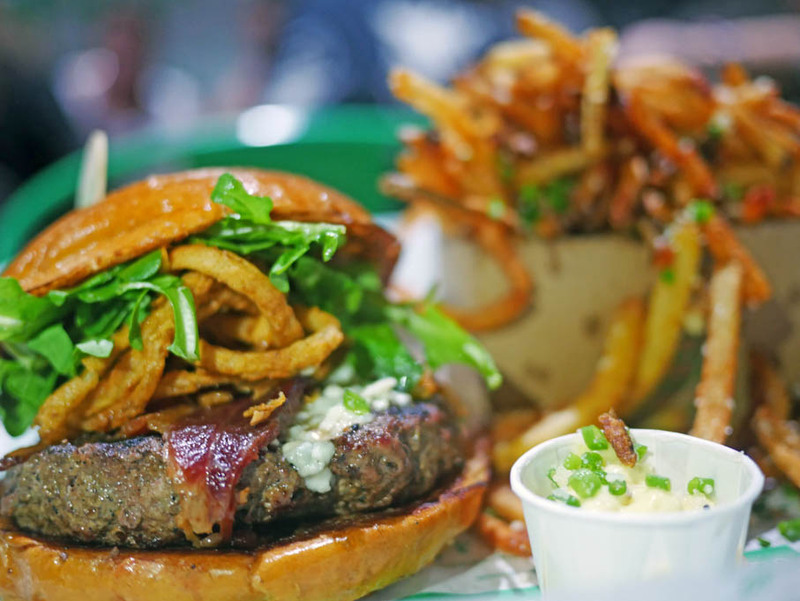 Deliciously tangy blue cheese, Bourbon Onion Jam, Arugula, and Hand Cut Bacon. I’m drooling on my keyboard right now just remembering it. Paired with the Truffle fries. – hand cut and topped with parmesan, truffle salt, truffle oil and served with a side of truffle aioli, it was perfection. 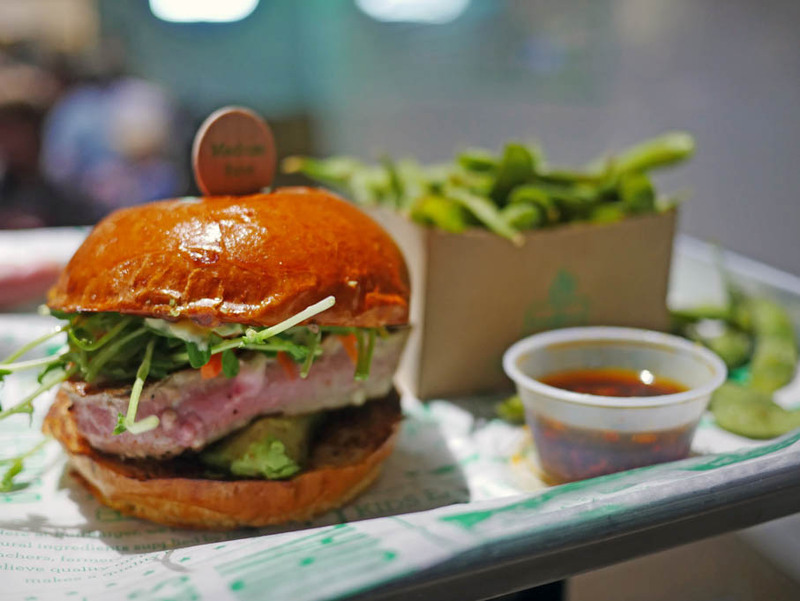 Next we had the Ahí Tuna burger. A beautiful ahi tuna steak cooked perfectly with avocado, sprouts, pickled carrots & daikon, a wasabi tartar sauce and a side of edamame. 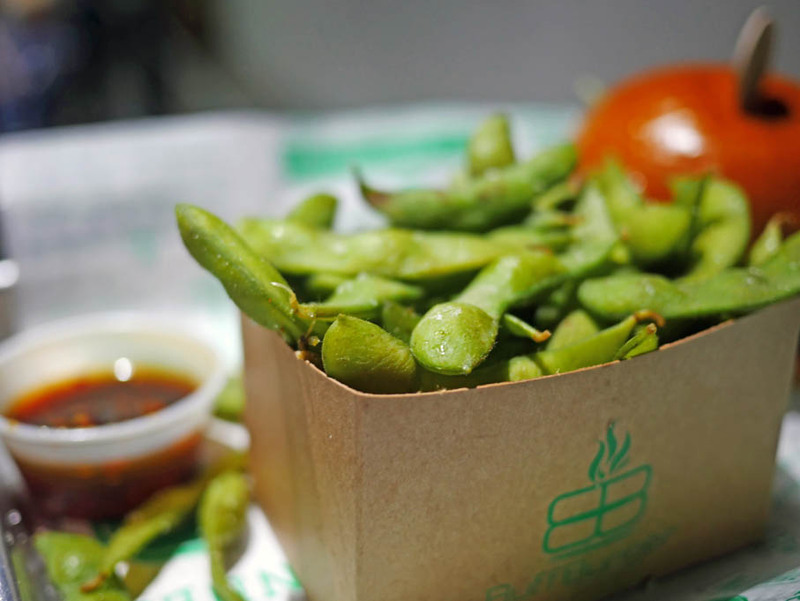 A great sandwich already, Chef Buff is planning on tempura-ing the avocado to kick it up a whole other level, which – wow. Next we tried a brand new recipe, the Pork Belly burger. Can you say melt in your mouth amazingness? Sous vide-d overnight, and then grilled and lightly fried, this new creation is a great addition to an already peak menu. The next two things brought out were unexpectedly some of the most eye opening of the night. Being excitedly carnivore, you would think the veggie burger wouldn’t exactly set my hair on fire. Boy was I wrong. 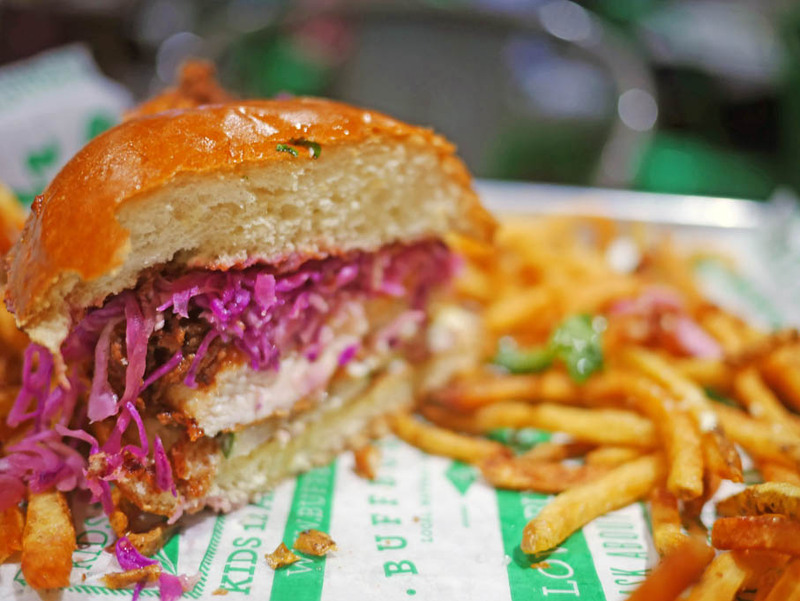 The street corn fritter burger was to dine for, and the Chunky Guacamole and Pickled Red Onion really brought it all together. The second veggie option was the thai noodle salad topped with a street corn fritter patty. The chuka soba noodle, Herbs, Pea Sprouts, Cabbage, Mango, Arugula, Avocado, Green Onion, and killer thai dressing had me questioning my life choices. Then I remembered the Blue burger and all was right in my meat loving world again. 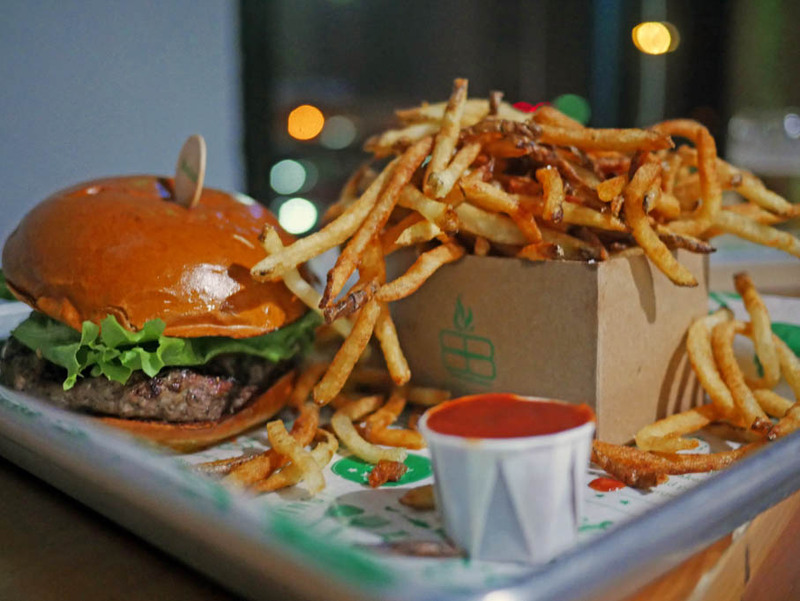 Right as we were about to dig into some amazing looking milkshakes, Chef Buff brought out a new off menu item that doesn’t have a name yet, but I think should be called The Morning After fries. 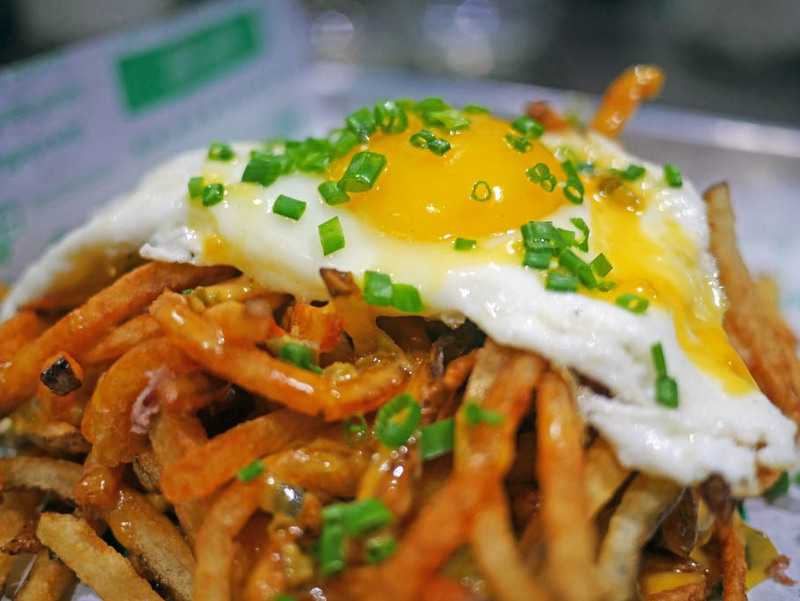 Their famous truffle fries topped with house made jalapeño queso and a sunny side up fried egg and chives. I was already bursting, but it was so good I happily gobbled some up anyway. The night was winding down, so Chef Buff sat down with all of us and hung out for awhile. I’m sure you can imagine what happens when you get a gregarious chef and a bunch of foodies together. 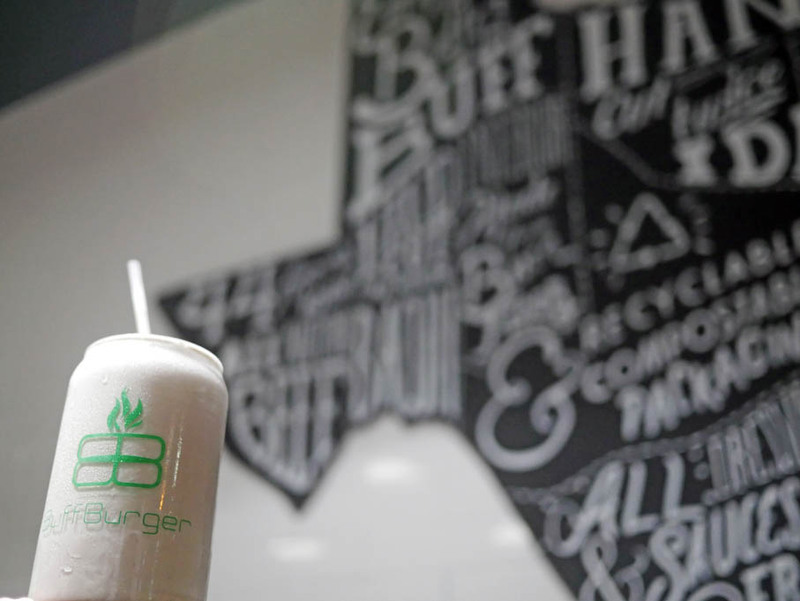 We talked about favorite restaurants and dishes from around Houston, future plans for Buff and his co-owner wife, and the interesting history of BuffBurger itself. It was great to hear about how Buff backpacked around the world as a cook for hire, on a quest to simply learn new flavors and techniques from other chefs. 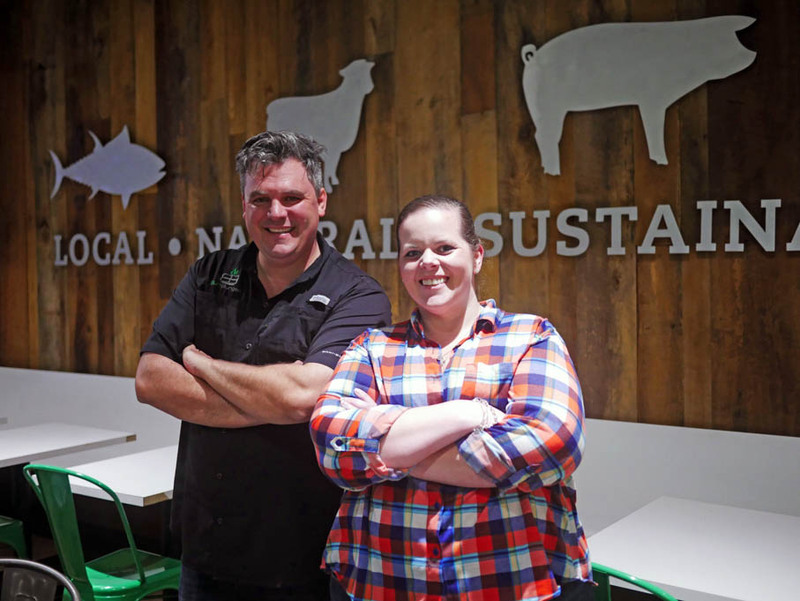 And about how upon arriving in New Zealand, where the grass fed beef was “extraordinary”, he found a burger culture that was the initial inspiration for BuffBurger. The idea percolated in his mind for awhile until he came to Houston where his wife is from and they found exactly what they needed to accomplish the vision. 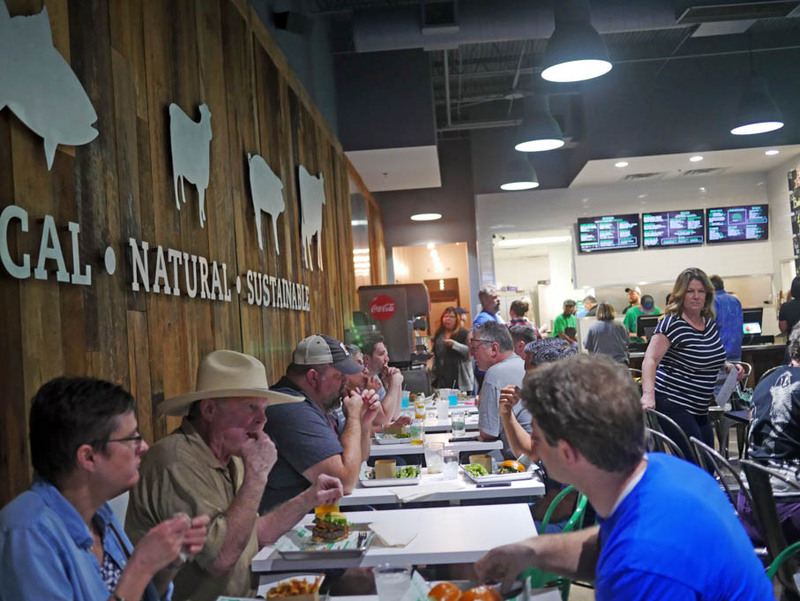 Between 44 Farms meats, Slow Dough bakery breads, Houston Dairy Maids, great local breweries, and Amy’s Ice Cream for the shakes – he loved all the ingredients he found and people he met. Suffice to say, this globe hopping Londoner quickly became an adopted Texan. It was amazing to take a moment and realize that we were sitting in a chair, at a table in a restaurant – in Houston, Texas – that began as just a little seed of an idea in the mind of a young backpacker from England traveling the world in search of new flavors. He and his wife came a long way and worked hard to achieve their dream of a place where using the best fresh farm ingredients, prepared simply, makes great food for their community. And I for one can’t wait to come back and see what other surprises the Buffs have in store.